The causes of Chipotle's pork problem have been revealed. 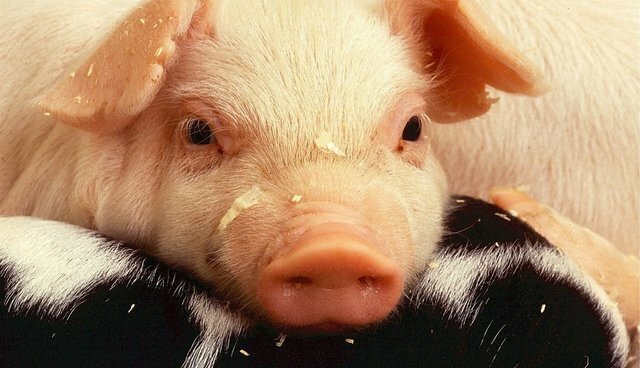 Last week the restaurant chain announced that pork items would be off the menu at one-third of its locations, citing concerns of animal mistreatment by one of its main meat suppliers. Now an industry insider has revealed to NPR's All Things Considered that the farm in question violated company standards by using farrowing crates and slatted floors - technologies that make life easier for farmers and hell for pigs. Chipotle has not publicly disclosed what violations led the company to ditch the supplier, but here's what we know about these two widely-used cruelties of factory farming. 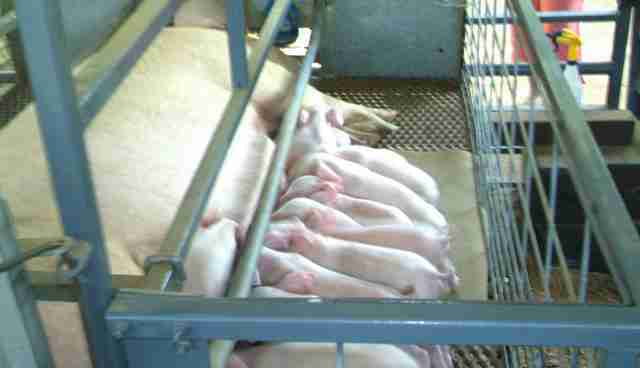 Farrowing crates, like controversial gestation crates used to keep pregnant sows contained, are stark metal cages intended to limit the movement of pigs - in this case, those who are nursing their newborns. For weeks at a time, female pigs are held in close confinement, unable to roll over or stretch their legs while their offspring feed. Although these crates are seen as a way to limit accidental injury and death to fragile piglets by their mothers (in turn increasing farm production), animal welfare supporters say that problem can be avoided by simply giving the pigs more space. Flooring might not be the first thing to come to mind when considering the mistreatment pigs raised for meat are forced to endure, but activists say it can be a major source of suffering. Slatted floors, designed with openings to allow animal waste to fall through to container bins below, are commonly used on factory farms. While this infrastructure makes cleaning up less of a chore for farmers, the hard surface is both uncomfortable for pigs and potentially dangerous for piglets whose small legs can become trapped between the slats. Chipotle has been praised for its animal welfare standards and requires pork suppliers to provide "deeply bedded pens" as well as "access to the outdoors." These basic amenities might sound like needless luxuries to many factory farmers, but the restaurant chain says it has had little difficulty finding farmers willing to comply. "We believe that these are good people who are trying to do the right thing, and if they bring their protocols into [compliance] with our standards, we'd certainly consider having them back as part of our supply network." Meanwhile, Chipotle is making the most of its self-imposed pork shortfall. The company is launching a promotion later this month offering free food with the purchase of Sofritas - a burrito made with tofu.